Civil servants, representing one-fifth of France’s total labour force, went on strike on Tuesday (10 October) to protest against Emmanuel Macron’s planned economic reforms. EURACTIV Spain reports. For the first time in ten years, all trade unions on in the public sector agreed on the strike. Similar protests and a general strike were held in September but did not achieve a critical mass. On Tuesday, nine trade unions called for a general strike and held demonstrations, signalling growing unrest over the government’s budget cuts. The strike concerned 5,5 million civil servants – at a national and local level, as well as in hospitals, public transport, and public schools. About 30% of flights were cancelled, in accordance with the directorate general of civil aviation (DGAC), and 17,5% of teachers went on strike, according to the French ministry of education. Demonstrations in Paris drew a crowd of 26,000 according to the local authorities’ count, while trade union CGT argued that 400,000 workers had joined around 70 protests throughout France. Cutting 120,000 public jobs by 2022, raising taxes for civil servants (but not private employees), and stricter conditions for taking time off work are some of the reforms trade unions are protesting against. 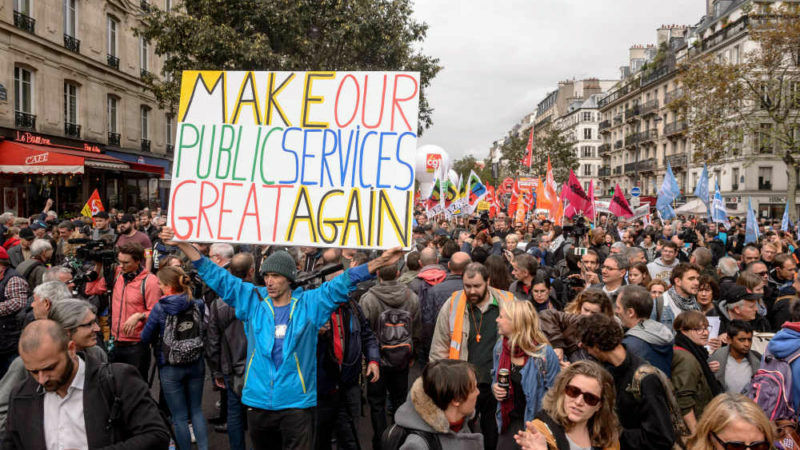 “All included, civil servants will lose between 4 and 5% of their purchasing power if all of the announced reforms are carried out,” Luc Bérille, secretary general of trade union UNSA, said at the demonstrations in Paris. The trade union official said the unions will wait until next week, when they are to meet the Minister of Public Action and Accounts, Gérald Darmanin, before deciding on their future actions. The minister has already made it clear that Macron’s executive will not backtrack on its savings plan, whose ultimate goal is to reduce public debt to below 3% of GDP, as demanded by the EU. “The government will listen and receive the trade unions that have every right to strike, but the parliamentary majority was elected to enact the president’s programme, especially the transformation of public services”, he said in a parliamentary assembly. About 20% of French workforce is employed in the public sector, placing France above the OECD average of 15%. Their remuneration accounted for 5.7% of national GDP expenditure. Fabrice Loiseau was among the thousands of civil servants at Place de la Republique in Paris, brandishing a banner demanding to defend civil servants to ensure public services. “Macron said that our purchasing power would grow,” complained Loiseau, who works in the appeal court in Paris. Only minor incidents between protesters and the police were reported in Paris. Philippe Martinez (CGT union leader), heading the fight against Macron’s labour laws, said: “civil servants are treated as some sort of opportunistic loafers. This is what hurts the most”.